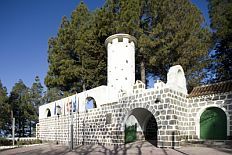 Tejeda is a little village on Gran Canaria, the third largest of the Canary Islands. Home to the Cruz de Tejeda, this stone cross sits on a mountain pass marking the centre of the island and has become a hugely popular attraction. There are restaurants, bars and shops and even donkey rides for the children. 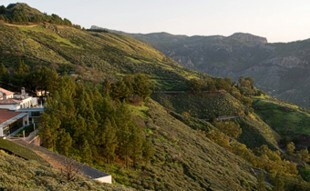 Tejeda itself sits on the slope of an extinct crater and is surrounded by cornfields and orchards. In days gone by the villagers would sustain themselves by farming however as the village grew farming was no longer enough but thankfully tourism kept it going. The villagers have worked hard to preserve their heritage though by maintaining their traditions and customs, and therefore skills such has lace making and weaving continue today. The first inhabitants on the island were the Guanches, and there are many archaeological findings in this area that include interesting caves, rock paintings and burial sites. There is also a natural rock formation called the Roque Nublo which they used as a place of worship. The higher peaks near the village have always attracted lots of hikers, and so walking holidays are very popular on Gran Canaria. One of the trails is the Caminos Reales (or Royal Paths) which were the paths originally used by the Guanches. If hiking is not an option though, there are also Jeep Safari tours available several days of the week. In the centre of the village are the Nuestra Senora del Socorro Church and a couple of museums explaining the history and traditions of the island. Tejeda also has its own Parador on the outskirts. The Parador Hotel de Cruz de Tejeda is a four star hotel is located in the mountains with a gym, spa, restaurant and incredible views of the island. A particularly special time of year to visit Tejeda is when the Almond Blossom Festival is held in February. This is when the village is at its prettiest because all the trees are in blossom. Everyone gets dressed up for the festivities and a good time is had by all. One of the local delicacies you must try while you are there is a marzipan sweet, made of almonds and honey called ‘Bienmesabe’. Carnival time is also in February which is quite a spectacular event. The whole island is devoted to its traditional fiestas so there are many festivities throughout the year, most of which take place from May to the end of August. Beyond the village there are many other wonderful places to explore. Las Palmas de Gran Canaria is a one of Spain’s largest cities and is located on the north of the island. It is also the second largest port in Europe. There is also the Parque Rural del Nublo which is the largest protected nature area on the island and covers over 26,000 hectares. Playa del Ingles is the largest resort on the island, although quite modern. So if you prefer something more quaint you should visit Mogan, otherwise known as ‘little Venice’, with its canals, whitewashed houses covered in brightly coloured flowers and tree lined streets. Because the centre is pedestrianized, it is quite a pleasant place to sit and have a coffee while you watch the world go by. Mogan also has its own market every Friday morning selling everything from food to pottery goods. Gran Canaria has just about everything you would look for in a holiday, with its beautiful weather, lovely beaches and spectacular interior of mountain ranges formed by volcanic activity. Although there are many resorts on the island, should you wish to stay somewhere less commercial and in a more tranquil setting, then look no further than the Parador Hotel de Cruz de Tejeda.